The Jamaican national team called up the 2016 MLS Goalkeeper of the Year for this summer’s gold cup. 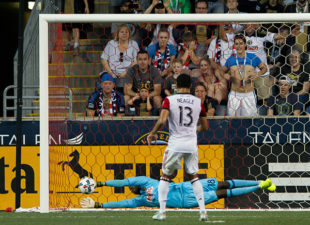 Andre Blake, the Union’s superhuman shot stopper, could potentially miss the next eight games. With all do respect to the Reggae Boyz, Philadelphia will be rooting for their swift exit. In Group C with El Salvador, Curaçao, and Mexico, Jamaica look likely to advance to the knockout stages. Blake’s absence will be a challenge to overcome. Just look at Saturday’s performance against D.C. United. He made two game-altering saves to preserve the victory. The first was the penalty from Oguchi Onyewu’s handball in the box. Blake dove low to his right, denying Lamar Neagle’s attempt to tie the game. After the initial stop, Blake had the composure to scoop the rebound out of play, killing the danger. Credit goes to both Blake and goalkeeper coach Oka Nikolov, as stopping a penalty is a combination of fortune, skill, and scouting. Blake’s most impressive moment of the match came in the 92nd minute. Neagle found space in the box between Onyewu and Giliano Wijnaldum. He unleashed a powerful free header that looked destined to salvage a point for the visitors. Blake denied him. The keeper made a leaping, acrobatic stop no goalie in MLS can mimic. His athleticism is unmatched in this league. In fact, there are not many keepers in the world who can rival Blake’s shot-stopping ability. It’s a disservice to say Blake is the only reason Philadelphia collected three points. Yes, without him the Union would be looking at a fourth consecutive match without a win. The same, though, could be said about Alejandro Bedoya and Fafa Picault. If one of those three players were not on the field, it’s difficult to imagine Jim Curtin’s side winning. This brings us back to the beginning. Philadelphia is in trouble. Not only is Blake going to miss significant time, but so is the captain, Bedoya. It is important the two replacements, Derrick Jones and John McCarthy, play well. It’s more tantamount to the team’s success the rest of the team elevates its game to mitigate the absence of its two best players. While Blake is away, it’s nice to have highlights like the ones from Saturday. When you say Blake could miss 8 games, are you including the Swansea game that he would likely miss anyway and the regular season game after Gold Cup is done, plus potentially two open cup games where McCarthy might have played anyway? I ask since there are only 4 regular season games between now and the Gold Cup finals. July 2nd (NE), 6th (SKC), 19th (MON), 22nd (CLB), and 26th (CLB) would be the league games Blake could potentially miss. The Open match tomorrow, a potential quarterfinal, and the Swansea game are the other three. The total is a little inflated, but the point is he could miss a significant chunk of action. Ahh..OK. Somehow I missed the Montreal match when I was looking at the schedule. Looks like we should root for Canada to make the quarterfinals since Montreal has three players on their squad. I’d be surprised if Jamaica doesn’t make the QF since they should probably finish 2nd in their group.